Dorm fridges should only be subjected to chilling beer and preserving half-chewed slices of pizza. Which is why we take a leaf from Daniel d’Entremont’s book and give our respective dorm fridges the upgrade of a life time. 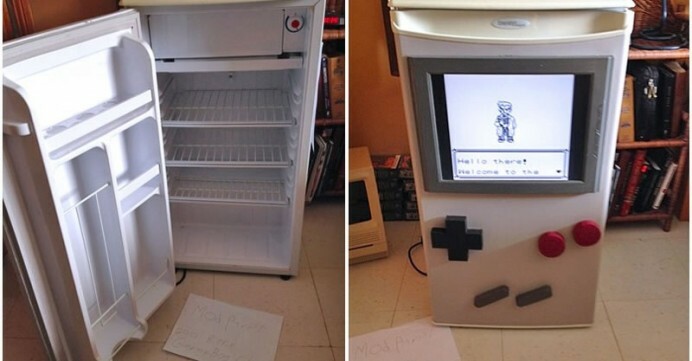 He has converted his refrigerator into a giant Game Boy. So, chilling out with him doesn’t only mean you get to game but also have a cool swig of beer later. While the fridge requires you to get down to your knees to play the game, it’s a novel idea and one we wouldn’t mind elevating to be our aspirational mission. The buttons and LCD have been incorporated into this fridge by hollowing a portion of the door, something we wouldn’t recommend most of you to try out at home. Daniel calls the fridge the ‘Cold Boy’ and why not. The console is powered by Raspberry Pi 2 while the console is handmade with wood. An old, cheap monitor helped as the display and a Game Boy emulator brings back the retro gaming device to life. It took the maker just nine hours to make!